After Tess’ birthday, Mary Poppins became a thing around here. Well, for Jac and I anyway. It began one evening while he was out with the boys and I was in with the girls. I texted him the varied and many ways they were driving me crazy and how I was failing them. “Why don’t you take them downstairs and cuddle up with some books?” was his suggestion. “Who do you think I am, Mary Poppins?” was my answer. And so it was born, this thing with Mary. Mary Poppins would . . .
Mary Poppins could . . . There were tears and not from the kids. The troops were gathered and the girls set to work on school. 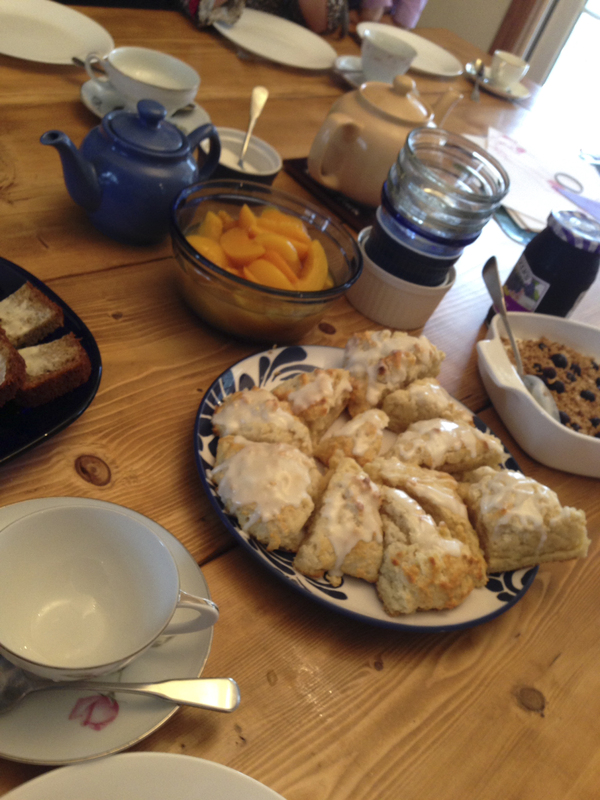 The boys had been asking and asking to bake up some scones from a recipe in their most recent mystery series so I announced we would be having a tea for lunch and, holy wow, did the place start to hum. Max measured and stirred. Philip squeezed lemons and sifted sugar. 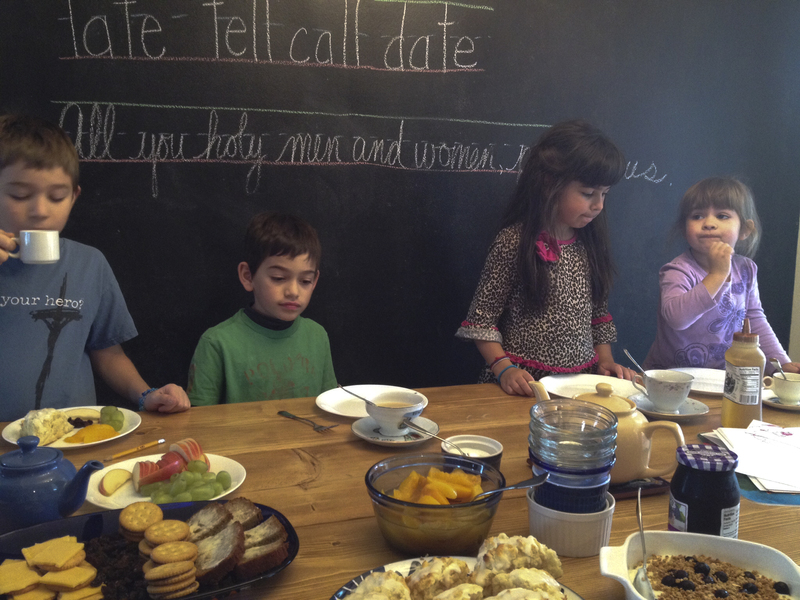 Before long, the house smelled delicious and attitudes mostly matched. The excitement of busting out our tea cups! Of brewing some Columbia Kate’s tea! Of honey and sugar and milk, oh my! Admittedly, it was more of a Mad Hatters kind of affair than a Ms. Poppins party, but it was fun nonetheless. Jac joined us and, upon my questioning, admitted that I had indeed my objective. He smiled his, “I-told-you-so-smile” and assured me I had. Day saved! Mission Mary Poppins Accomplished. Those scones I was talking about? DELICIOUS. And really, really easy. They disappeared off of the plate and have been highly requested since. The icing is magical – the kiddos don’t do lemon but they eat this directly from the spoon or bowl or scraped off the cookie sheet once the scones are gone. The scones rise an incredible amount. When patting them out, make them 1/2 -1 inch thick. The icing recipe can also be cut in half OR just make it for a double batch of scones. You won’t regret it. Sift together flour, baking powder, salt, and sugar. Cut in the butter until the dough looks crumbly. Add in milk and stir gently. Press dough onto lightly floured surface. Cut into squares and then half them into triangle shapes. Bake on an ungreased cookie sheet at 400 degrees for 15-20 minutes. yummy! I will have to try this recipe. My kids have been devouring the pumpkin scones I’ve been making! You are such an inspiration and great mother! Such fun! Wish I could have been there! Perfect winter day!!! There is just something magical about tea!